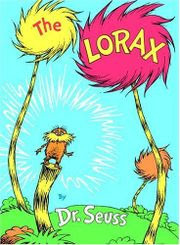 I considered referring everyone to Dr. Seuss' _The Lorax_, in fact, I think I'll still do that. Here's the basic information, and I suggest you buy a used copy at your local independent bookstore, or from Amazon, to save some trees. Here's a Tree Poem offering in honor of Earth Day. It's "The Presence of Trees" by Michael S. Glaser.